Are there Missing Words from the Serenity Prayer ? Most of us are familiar with the Serenity Prayer. It’s moving and inspiring. Which words resonate with you? No matter which words resonate, it dawned me that there may be some missing key words for me and some of you. 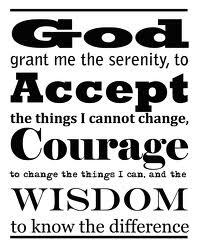 To me the Serenity Prayer is about letting go of control and trusting to something bigger than ourselves. When you read the Serenity Prayer, instead of it soothing you in a “I wish it could be” sort of way, think about how you can really bring it into your life and what you might consider differently. How can you live this wisdom? One very practical way is to think in terms of what you are holding on to in order to feel in control and what is controlling you. From the abstract bring it into the specific. From the ideal make it work for you here and now. What aspects of my life are controlling me right now? What don’t I control but have been trying to? What do I need to let go off? What could I control that I have not? Where can I trust where I have been holding back? Just like the Serenity Prayer, when we see a new perspective it opens up choices. Why not take a moment and consider what could you let go of or take action on to find serenity in your Middle Ground? I tried to identify which version was more familiar to me, and realized that I have no idea. Maybe I have seen both, maybe not. They both make remarkably equal sense. Thanks for pointing this out. I really like this kind of discovery. 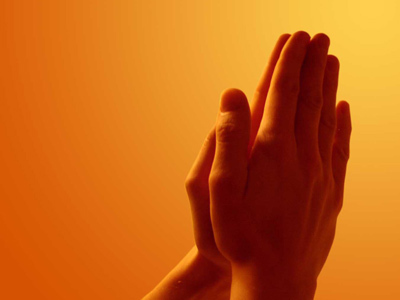 Thanks also for pointing out some directions we can go to implement this prayer. Great questions. There’s a song by Emilie Sande with the line ‘I wake with good intentions, but the day it always lasts too long’. 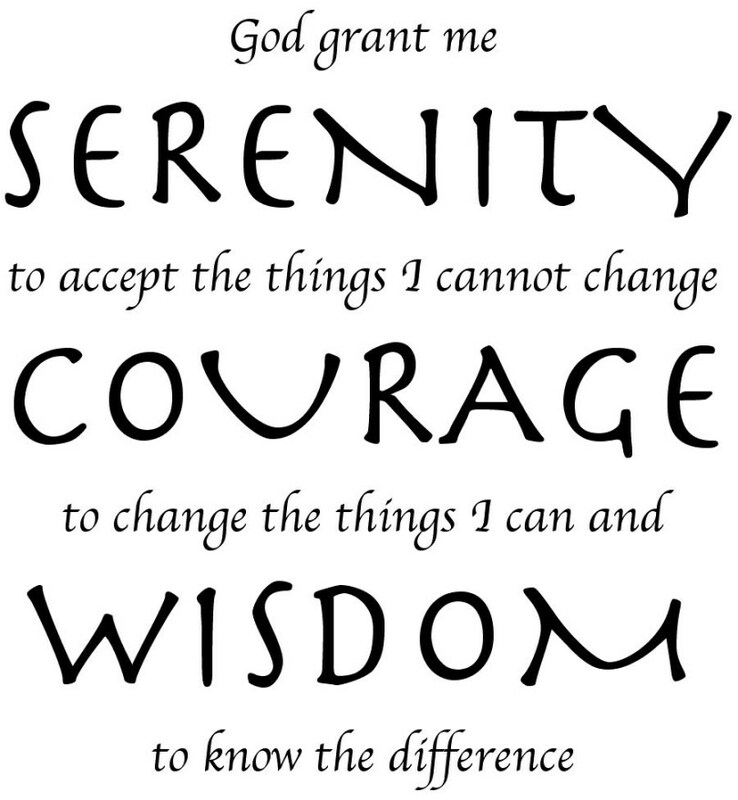 I say the Serenity Prayer every morning, but as the day goes on I tend to forget all about it and carry on in the same old way – which, quite often, is anything but serene! Thank you for these useful pointers, and thank you for following me and Millie. Following you right back! I know this prayer well.. And you are right Val.. so many times we do not realise how conditioned we are as we are held within our own controls as we develop and mature within a world conditioned to control . So many times we are taught not to Trust.. and that to succeed we need to attain things, wealth, power etc to feel worthy.. Letting GO.. of these things goes against what we were taught and so finding a new perspective from which to Trust and let go is often the hardest to accomplish. Yet when we surrender to our Higher selves and Trust in the Power of the Universe we then find that through acceptence we gain new courage and strength in letting go..
We then find the serrenity and peace within us as those external demands we find we no longer need be a slave to.. For all is well in our world if we would just go within the flow of it..
A wonderful Post dear Val.. and I am so pleased you shared it again with us..
Good food for thought, Val. You hit my hot buttons that fuel my practice – control, letting go and trust. This prayer continues to inspire me! The word ‘accept’ jumps out to me, always has.